"Someday this war's gonna end." Francis Coppola is a grand man of the sort we rarely see: great ambition and great talent to go with it, a career of extraordinary successes and of failures on the most colossal scale. In interviews, he talks of wanting to make small, personal films, and occasionally he has done so, to much acclaim (e.g., The Conversation), but for better or worse, he's known more for films that have been rightly lavished with praise (The Godfather has been called the best American film since Citizen Kane), and intense scrutiny of his very public, financially out-of-control projects, like One From the Heart, or, most notably, Apocalypse Now. Hindsight may not be 20/20, but it does provide at least some amount of clarity; what's here is an astonishing gambit of a war film, with some extraordinary images and sequences, a movie that's been parodied and has become a cultural lodestone, but one that close to evaporates in its third act, despite the best intentions of Coppola and particularly of his editor, Walter Murch. While students at USC, George Lucas and John Milius had the notion of taking Joseph Conrad's Heart of Darkness and moving it to Southeast Asia at the height of the Vietnam War, and through a series of arcane developments, the script ended up with Coppola. Martin Sheen stars as Captain Willard, who is rescued at least temporarily from his demons by a top-secret mission: he is to go up river, over the border and into Cambodia, to find and terminate Colonel Walter Kurtz, a decorated Green Beret who has, according to all reports, become unhinged and made himself the center of a messianic death cult. Willard's journey is the best part of the movie�he's ferried by the reluctant crew of a PT boat, and the imperative to find Kurtz is what links together what might otherwise have been odd episodes along the way. Sheen exudes both quiet authority and chasms of self-doubt in his performance; he is here to witness, principally, and we realize that we don't know very much about him, but Coppola lingers over his hungry eyes just enough to let us know that it's all registering, that on some level this is Willard's transformative odyssey. Robert Duvall's may be the most bravura performance here�he's only in the very first portion of the film, as a single-minded lieutenant colonel intent on wreaking psychological havoc on the locals as he seeks the perfect wave. So much of Apocalypse Now has become so iconic that it's hard to imagine the last three decades of war movies without it�the helicopters blasting The Ride of the Valkyries as they swoop through the Vietnamese countryside is as much apart of our collective experience of Wagner now as it is of war, for instance. And though the movie's script problems were notorious, the level of talent on hand is pretty extraordinary�cinematographer Vittorio Storaro and production designer Dean Tavoularis deserve particular credit for the hallucinatory, saturated, nightmarish quality that seeps into every frame of the picture, and Michael Herr's narrations for Willard are searing monologues in which the man spares nothing and no one, especially not himself. You can almost feel the war movies to come as you watch this�there's a cameo by R. Lee Ermey, for instance, the drill sergeant in Full Metal Jacket, and the casting of Charlie Sheen, Martin's son, as the central figure in Platoon seems in many respects a direct response to Coppola's film. Its legacy among fighting men may be a dubious one, though, as we see in Jarhead, in which Coppola's grim sequences and critique of the dangers of imperialism become shots of testosterone for young men girding for battle. No doubt early on audiences now get a jolt from a geeky, bespectacled Harrison Ford; and my fellow Corleone completists will take special note of G.D. Spradlin, aka Senator Frank Geary, as a general sending Willard on his way. And now a word about Marlon Brando, who plays Colonel Kurtz. Perhaps no actor could deliver on the promise of the first two acts of this movie�Kurtz is described as a person of superhuman capacity, a warrior, a shaman, the best and worst of America. It's obvious, though, that Coppola's script problems were exacerbated by the on-set appearance of an ill-prepared and grotesquely fat Brando. On some level it's upsetting to see what an unseemly physical specimen he had become�he was a bull as Stanley Kowalski, as Terry Malloy, and here he's nothing but appetite. You can almost feel the project getting away from the filmmakers once Willard gets to his destination, and I've always wondered if on some level this isn't a parable not just of Vietnam, but of the course of Brando's career and of Method acting in America. Once you decide that one person is the paradigm, what is that one person to do? Apparently eat beyond all measure and make stuff up as he goes along. 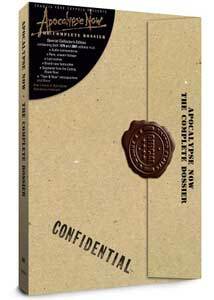 This DVD set includes both the 1979 original theatrical cut of the picture (02h:33m:16s), and the extended version released in 2001 as Apocalypse Now Redux, the best portion of which is probably the notorious French plantation sequence, in which Willard and the PT boat crew journey literally into the past, to find the vestiges of French rule in Southeast Asia as Willard heads toward his very own hell in a very small place. Its inclusion here, along with the other scenes added for Redux, are beautifully melded into the whole by Murch; but even he and this previously discarded footage cannot really make the film cohere. Is this what Vietnam was truly like? Almost certainly not, but the movie is about a whole lot more than verisimilitude, and ultimately it's a reminder that what matters is not the destination, but the journey. Image Transfer Review: The history of the aspect ratio of this film is the stuff of doctoral dissertations; the transfer here makes the movie look spectacularly sharp, but there are problems. The movie was shot and originally projected in the reasonably standard 2.35:1 widescreen ratio, and yet for home release we continue to get versions of the movie in a 2.00:1 ratio. It doesn't brutalize the feature the way a complete pan-and-scan hatchet job would, but still, you need not have the most discerning eye for cinematography to recognize that Storaro's work, especially compositionally, is frequently compromised, with some elements given undue emphasis, others dropped out of the frame entirely. When a set is subtitled "The Complete Dossier," you'd hope that they'd get something like this right. Audio Transfer Review: We have this film to thank for the birth of Dolby 5.1, and the movie makes the most of it. Sound dispersal is spectacular; balance is fine; clarity is unparalleled. Extras Review: It's a pleasure to have both cuts of the film on one set, but, despite the subtitle given to this package, it rates an Incomplete. The most glaring absence is of course Hearts of Darkness, George Hickenlooper's documentary about the making of Apocalypse Now, one of the great portraits of a filmmaker at work in crisis�Coppola even refers to it with some frequency, and its inclusion here could have made this the paragon of special editions. And as long as we're blue skying, how about Notes, the wrenching diary published by Eleanor Coppola, Francis's wife, from the years of the making of the film, and a crucial part of Hickenlooper's project? And Conrad's novella, too, for good measure, and Milius's original script? And a pony? Anyway, the set overpromises two commentary tracks from Coppola; it's the same track over both films, with some modest additional observations for the material added for Redux. So if that's a bit of a letdown, three hours with Coppola talking film is certainly time well spent�he's much more forthcoming and candid than almost any other filmmaker, not reluctant to share his doubts and fears. He talks about going into the project thinking about it as very mainstream, his effort at making a movie like The Longest Day, a studio war picture that would give him the opportunity to make his own little, personal movies. He's winning discussing dealing with a fat Brando, casting a very young Larry Fishburne (14 at the time), and on the actors finding their characters�Duvall was the first to breast the tape, Frederic Forrest as Chef brought up the rear. There's lots of great production history, casting issues (including the false start with Harvey Keitel as Willard), and tales of lunacy in the Philippines; Coppola also provides separate introductions to each of the two versions of the film. The next set of extras comes under the heading A/V Club, for technical geeks like myself. The Birth of 5.1 Sound (05m:53s) is a tutorial on the evolution of theater speaker setups; Ghost Helicopter Flyover (03m:57s) discusses the opening sequence of the feature. Reproduced is an article from the January 1980 issue of Contemporary Keyboard Magazine by Bob Moog called Apocalypse Now: The Synthesizer Soundtrack, and your reading list continues with a technical FAQ, in which the aspect ratio issue (among other questions) is addressed. Editor Walter Murch dominates the special features on the second disc, most of which come under the heading The Post Production of Apocalypse Now. A Million Feet of Film: The Editing of Apocalypse Now (17m:55s) features Murch, Coppola, and supervising editor Richard Marks; The Music of Apocalypse Now (14m:44s) includes footage from the original scoring sessions, and a look at the soundtrack contributions of Carmine Coppola and Jim Morrison, among others. Under the heading Heard Any Good Movies Lately? comes two more pieces: in The Sound Design of Apocalypse Now (15m:20s) Murch dwells on authenticity as his priority; after all his work, we see that The Final Mix (03m:08s) took another nine months. PBR Streetgang (04m:13s) features reminiscences from the actors who played the crew of the boat, including Larry Fishburne, Sam Bottoms, Albert Hall, and Frederic Forrest; particularly interesting is rehearsal footage from back in the day. (Conspicuously absent from the extras package are Brando, Sheen and Duvall.) Apocalypse Then and Now (03m:49s) compares the original cut to the 2001 re-release, and the role of the Cannes Film Festival in both; and The Color Palette of Apocalypse Now (04m:10s) discusses dye transfers and allows Storaro a chance to amplify on his extraordinary camerawork. A note on packaging: rather than having the movie on one disc and the extras on the other, each of the two DVDs houses half of the feature (called, a little preciously, Act One and Act Two), along with a battery of extras; you can also choose the Redux Marker, which will alert you as to which scenes were added for the 2001 cut. (Rather than subtitles, in this option you'll see, on the bottom of your screen, a bit of text that reads, appropriately enough, REDUX MARKER.) Also, the whole set is done up to look like the secret Kurtz file that's given to Willard; it looks nice, but the plastic spindles holding the discs in place are flimsy and tend to snap off. Here's one instance where I'd trade for function over form. Apocalypse Now may be deeply imperfect, but it's an essential movie in all sorts of ways. Coppola aims high, and if he sometimes misses his mark, you've got to applaud his audacity, his accomplishment, his talent and his perseverance�there's some amazing stuff here, and it's great to have both authorized theatrical releases of the film on one DVD set. "Complete" isn't quite right, but it's as good as we've had so far. Never get off the boat.